Do you recognise any of these faces from the 1951 Leitrim Society of New York Dinner Dance? Cllr Finola Armstrong-McGuire visited the Leitrim Society in New York as Cathaoirleach of Leitrim County Council and attended their 123rd Annual dinner on March 9 in Antun's in Queens Village. “The camaraderie, friendship and encouragement to participate in all things Irish that is promoted by this Society is admirable,” she said. “Today the Society is primarily a social one but they continue to work in fundraising for many causes both here in Leitrim and in New York. “ Whether it was the Annual Ball or the Society Dinner, whether in 1911 or in 2018 the events were greatly supported by those living in New York and sharing the love of their county of birth as an emigrant or the son or daughter of an emigrant. “Today’s committee continues to work hard to ensure that the Society is a vibrant and meaningful organisation. It strives to give recognition to those who have given much in a voluntary capacity whether in time, commitment and/or financially to friends of the Society in Leitrim and beyond. It creates a space for those from Leitrim to meet fold from home and discuss all things Irish. “I also walked on 5th Avenue in the St Patrick’s Day parade with the Leitrim Society and with the United Irish Counties. St Patrick’s Day in New York is so much more than the march on 5th Avenue. It is a gathering, a meitheal on our national holiday. “There is a massive recognition by world powers of the heritage of our people. “It is a unique opportunity to connect with Leitrim people, many of them now being second generation holding dearly to the heritage of one of their parents. Many are half Irish, and the other half while equally important may not have the unique opportunity St Patrick’s Day holds. 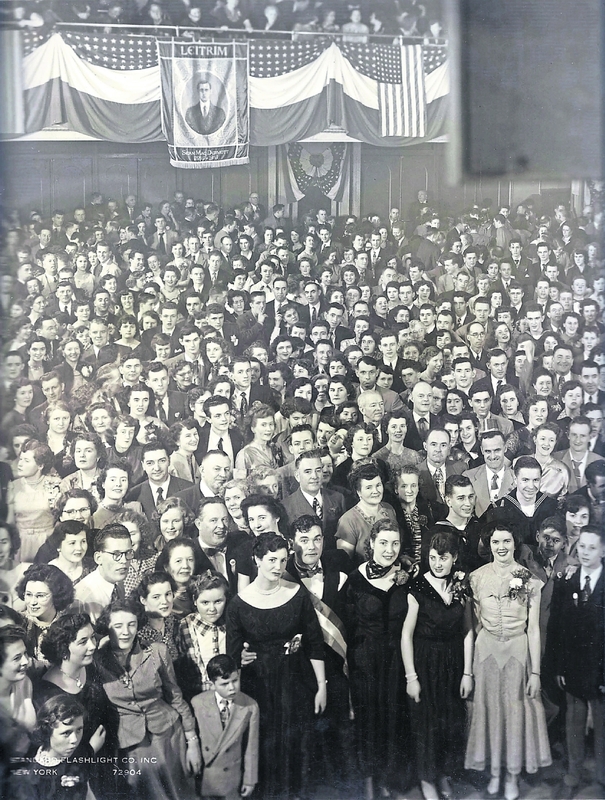 The Leitrim Society of New York Dinner Dance in 1951 with the Sean Mac Diarmada banner in the background. The same banner is still being used today. “The Mass at 8.30 in St Patrick’s Cathedral focused greatly on the many cultures of New York and the many faiths of those cultures with the man Patrick spoken of as one who understood cultures and all those years ago understood the pagan cultures of the people of Ireland. I wondered how many of our family members sat and prayed for family members over the generations in that cathedral? “I would encourage all those who have emigrated and are spending time in New York or any other city elsewhere to look up the Leitrim Association, Society or Club and become involved. Personal connection is more important than ever in all communities. “I visited New York not knowing what to anticipate as a guest of Leitrim People abroad. I was welcomed as a friend and a supporter by many who are truly friends and supporters of all things Leitrim whether within our county boundary or abroad where being from Leitrim is a badge worn with pride. “While waiting on 47th Street for the Leitrim Society to join the march there were many conversations among those gathered.